This spray deodorant is also alcohol free so it won't dry and irritate the skin. It is very effective and long lasting and can be used to eliminate existing odour and prevent underarm, foot and body odour, and to prevent or remove odours from socks, shoes, clothing, gym equipment, etc. One of our best sellers - mildly scented with combination of Patchouli and Sandalwood essential oils to keep you smelling fresh all day. Prevents or removes odours from socks, shoes, clothing, etc. Use it to freshen up yoga mat, hockey bag, etc. Directions: Shake the bottle well and while holding it upright and away from the body (8 to 10 inches) spritz 3-4 short sprays and then pat with your fingers to blend in. Apply as often as needed. Not a great deodorant. Good as a body spray though. Love these fragrances together. Good product, awful spray bottle (leaked every time I used it and I had to transfer it to another container)! Unfortunately this product did not work for me as a deodorant. Using it as an all over body spray. I recently purchased this product and was deeply disappointed. It certainly didn't work for me as a underarm deodorant. I loved the scent, but unfortunately it just didn't work protection wise. Now that could be the result of my various medications mixed with the ingredients in the deodorant. I plan to use this as a body spray after a bath. â�¤â�¤â�¤â�¤â�¤â�¤â�¤â�¤â�¤â�¤â�¤â�¤â�¤â�¤MY FAVORITE......I love the smell and works well...I reapply often and keep it in my purse. Works well for feet odor. Only thing that magically neutralizes the scent of cat urine. This is a very musky smelling deodorant. You definitely smell the Patchouli. Love the smell but doesn't last super long for me as an underarm deodorant. Have been using more as a general body spray. You can smell the patchoulli right away, and as far as the deodorant, it work amazing with my work shoes as I do not have time to wash them every week. I also use it as room spray. This spray smells amazing and does a great job!! I love Patchouli but this smells like bad mens cologne. It has a bug spray smell to it I was disappointed I love sandalwood and patchouli but this doesn't smell like either of those. I love this spray deoderant! Gorgeous scent, lasts a decent amount of time so thankful to have found it on my journey to take chemical deoderants out of my life. I love this stuff! I used it on top of my "Crystal Deodorant" for an added scent and the sandalwood scent, very pleasant smell might I add, remained for 24h! I got someone else to use it without anything else under it and she loved it. Fantastic deodorant. This is a marvelous all over spray. 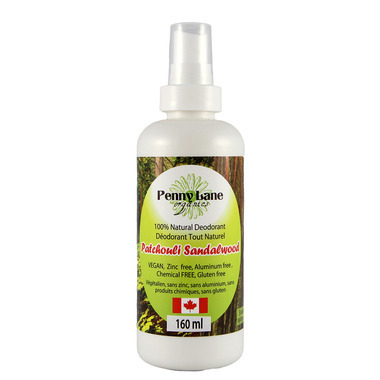 It's so versatile and the sandalwood, patchouli blend is perfect. I highly recommend it. Love the scent and I spray my shoes and my socks too. I love the smell of this, but for me it did not work as a deodorant. I am sooooo happy with this spray deodorant! This is my first time trying spray deodorant. I am very happy with the scent, texture and protection. I wanted to smell a little bit like a hippie and PL spray deodorant gives you exactly that. I also have sensitive underarms and I have not reacted at all! I am really happy with this product and would recommend it to everyone.